There are many Korean restaurants in Düsseldorf. My intention was to do a round up of the ones I’ve been to so far as well as the grocery stores. I’ll still do that, but I wanted to feature one in particular. Last week we invited my father-in-law from Mönchengladbach to meet us in Düsseldorf last Sunday for lunch. We asked him to pick where he wanted to eat, so weren’t surprised that he selected the restaurant Korea at Bismarckstr. 51. (Please don’t confuse it with Korea Haus just a few houses down on the opposite side of the street towards the train station. The restaurant I’m talking about is right on the street corner.) The owners of Korea ran the all-you-can-eat Korean buffet next door called Pusan. My in-laws used to love going there. We even celebrated my first born’s baek-il (100th day birthday) there. Bringing up Pusan is important because that is part of the point of this post. This isn’t just a restaurant review. This is a mini-lesson on an important aspect of Korean culture: where you are from. Pusan is what my father-in-law calls his hometown. It’s the second largest city in Korea and is in the southern half of the same province that my parents are from, Kyeong-sang-buk-do. Where you are from matters to Koreans. It’s more than the general conversation starter, “where are you from?” It’s more like, “who are your people?” Imagine the automatic affinity you feel when you meet someone from the same hometown in a far away land coupled with a deep sense of automatic kinship. In Korea, there are some historical rivalries between the provinces, so you feel even tighter with your own hometown clan. My father-in-law feels like he is with his people when he goes to the restaurant Korea. There he gets to experience a sense of go-hyang — hometown. I knew what he was feeling when the cook and owner came out to say hello. It was comforting for me to hear his distinct (southern) Korean dialect (satori) similar to the one I grew up hearing. And it was reinforced when we got “service.” Service is not unusual in Korean restaurants although I have to say it is not usually expected, particularly in Germany. 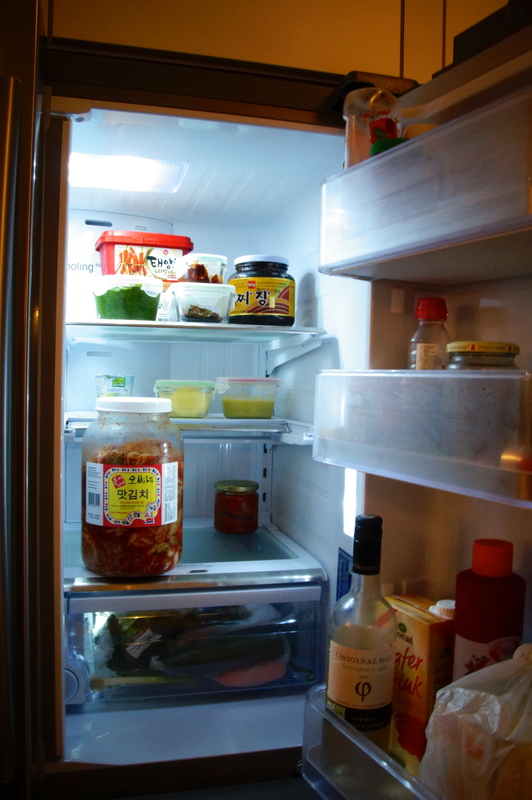 Basically, it is a surprise, unordered dish that comes out compliments of the house. 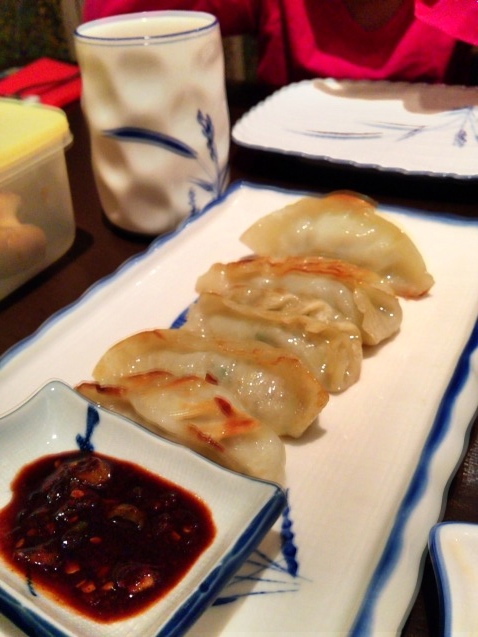 We were served two orders of fried mandu (dumplings). The kids particularly loved it, but who doesn’t like fried dumplings? We ordered a lot of food: four orders of galbi, galbi-tang (I know, repetitive, but my daughter really wanted to have this) and sun-dubu jjigae. So with the complimentary mandu and the fish, plus all of the banchan (ten different kinds), there was a lot of food for six of us. No problem though, my father-in-law happily made sure that nothing went to waste. 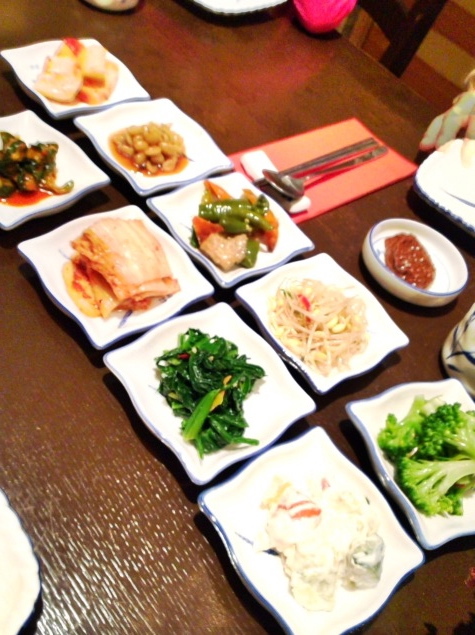 A great assortment of banchan. 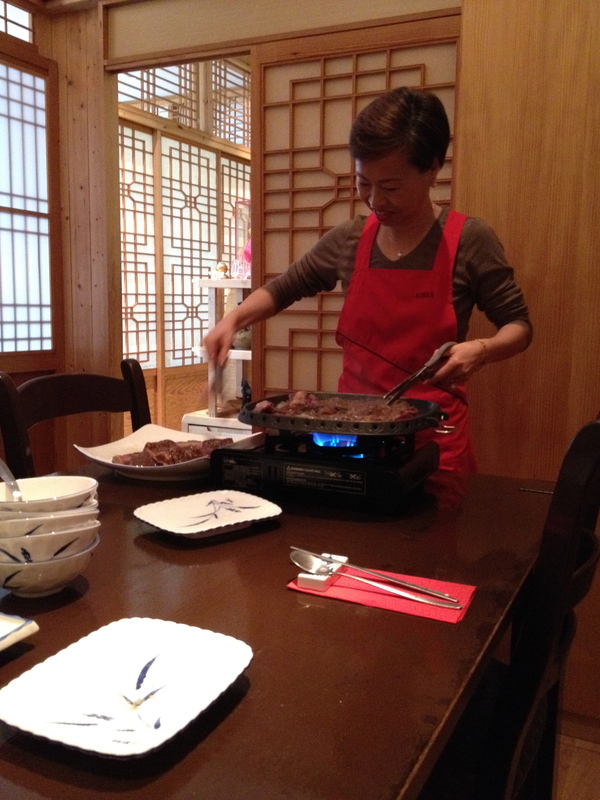 Ajuma grilling the galbi for us. 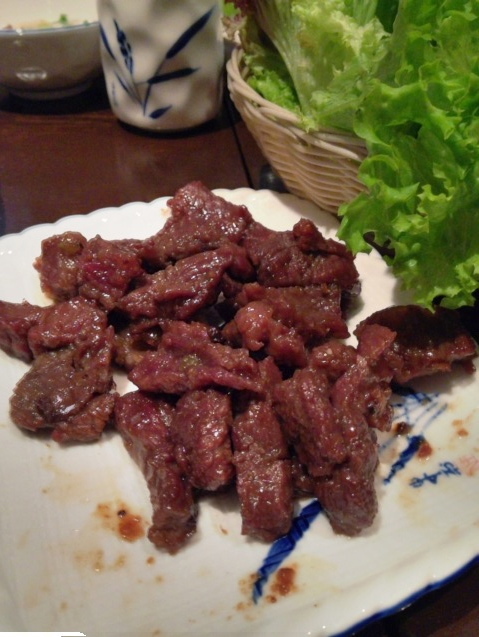 Grilled galbi. Perfect with sam (fresh lettuce to wrap). I don’t think they cared whether or not he cooked. They definitely wanted to be nice to him and help him out. So when we got up to leave after paying the bill that they generously rounded down for us, they surprised us. The cook again came out himself and was waiting with a huge bucket of po-gi kimchi. I seriously think it was about 5 kilos of it. Even if you or your family are not from southeast Korea, I think you will enjoy a delicious meal and will be well treated by the lovely people of the restaurant Korea in Düsseldorf. It is less than a ten minute walk from the Hauptbahnhof (Main Station) and one minute from the Oststrasse U-Bahn station. 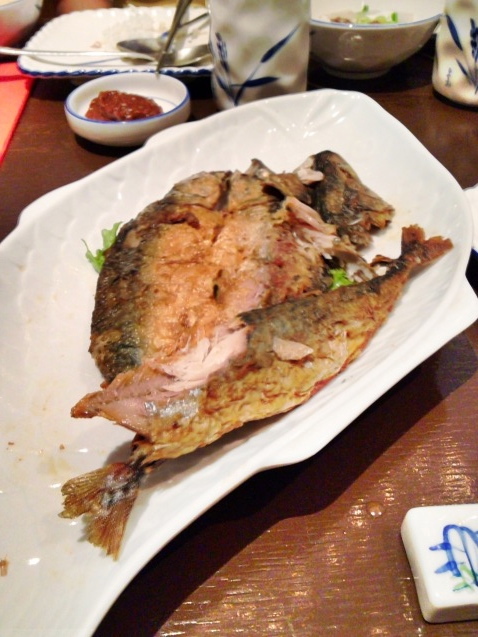 Tags: banchan, fried mackerel, galbi, go-hyang, Jane, kimchi, Korea Restaurant Dussel, Korean restaurant Germany, koreanisches restaurant Düsseldorf, Koren restaurant Dusseldorf, mandu, Pusan Dusseldorf, Restaurant Korea Dusseldorf, restaurant review, service. Bookmark the permalink.